DDG is gearing up to launch sales at 100 Franklin Street, an architecturally distinct project best known for installations by street artist JR.
Comprised of two newly-constructed triangular buildings joined together, 100 Franklin (pictured top) 04features 10 homes with open floor-through layouts. 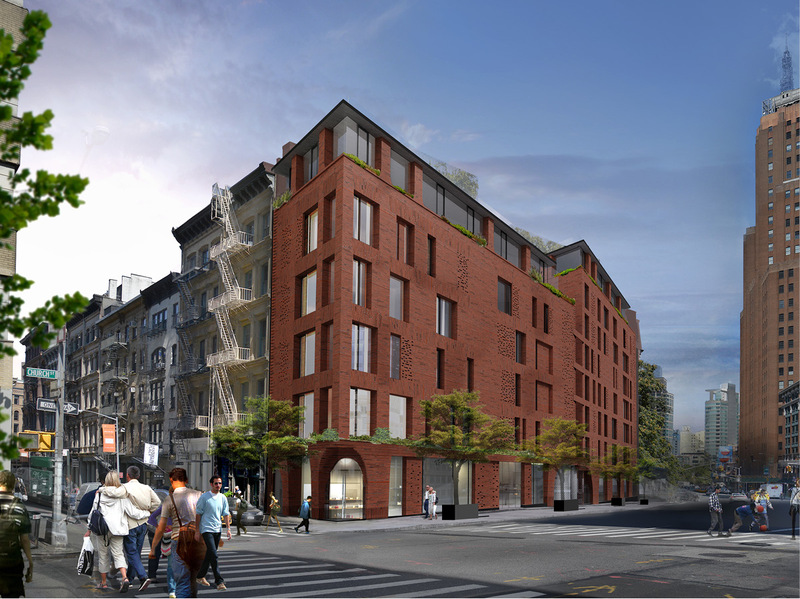 The development will feature a hand-laid brick facade comprised of handmade bricks by Denmark’s Petersen Tegl. Homes, which feature feature direct elevator entry, include two duplex penthouses with rooftop terraces. DDG has commissioned Paris-based artist and designer Charlotte Taylor to create new pieces that will be permanently installed within 100 Franklin Street, as well as new artworks that will be featured on the website and in marketing materials. Sales are slated to launch in February and pricing for residences starts at approximately $3.3 million. Douglas Elliman Development Marketing has been named the exclusive sales and marketing agent for 100 Franklin, and sales are being led by Michael Lorber, along with Alexander Boriskin and Eleonora Srugo. Vertical construction on the tallest of three luxury high-rise buildings in Jersey City’s Journal Squared project is underway. The developer, Kushner Real Estate Group, tapped the New York-based firm Hollwich Kushner for the architectural design, with Handel Architects as the architect of record. Melillo + Bauer Associates is providing landscape architecture services for the ground level and rooftop areas. Dresdner Robin is providing engineering, environmental and design services on the tower, which will stand at 71 stories, offer 18,000 s/f of retail space and boast a gross square footage of about 1,000,000 s/f. Altogether, Journal Squared is the largest development in the district in decades. The new tower, the second in a three-tower complex at 615 Pavonia Avenue, will feature 704 residential units. Upon completion, it will be one of the tallest buildings in Jersey City. The first building topped out in 2015 at 53 stories. The third tower, to be constructed following the project’s second phase, will stand at 63 stories. Connecticut-based RMS Companies launches its first development in North Yonkers that offers floor to ceiling views of the Palisades and a suite of amenities. Stratus on Hudson, a 74-unit luxury rental high rise is located at 1077 Warburton Avenue in North Yonkers. Rentals start at $2,500 for one-bedroom apartments and increase to $4,850 for premium two-bedroom, corner units offering panoramic views. Each resident will be surrounded by views of the Hudson River. Amenities include a resident’s lounge with an entertainment kitchen, cappuccino-bar and fireplace, a hi-tech fitness center with a private fitness-on-demand studio, a doggy spa, secured garage and a rooftop deck with outdoor TVs, a gas grill and glass railing overlooking the Hudson River and the New York City. The residential design features nine-foot ceilings, kitchens with white and grey marbled quartz countertops and stainless-steel high-end appliances. Bedrooms offer bathrooms with LED backlit mirrors, glass enclosed showers along with walk-in closets with built-in cabinetry. Balconies are available in some apartments and residents will enjoy a state-of-the-art package management system for convenience and 24-hour emergency maintenance service. Residents will take occupancy in February 2019. Sales are underway at 856 Washington Avenue, a 14-story condominium with 26 units in Brooklyn’s Prospect Heights. The developer is The Daten Group, along with its partner Valyrian Capital and the architect is Kutnicki Bernstein, with interior designer Stephanie Goto Design. The building is expected to be ready for occupancy by the end of this year. Two and three bedroom units are priced from $1.495 to $2.575 million. Douglas Elliman’s Williamson Team has the exclusive listing.